The graphite rods, in similar manufacturing processes to graphite tubes or tubing, can be fabricated according to custom specifications. They are cut to required sizes, shapes, diameters and length. Machined graphite, which is what is used to produce graphite rods, is usually the product of a copper and graphite composite. Relative to pure graphite, a copper graphite combination has the properties of improved conductivity and strength making it an ideal material choice for manufacturing a wide variety of machine components including dies, spindles and chucks. Furthermore, unlike metal components, graphite has high levels of corrosion resistance and does not break down under thermal shock. It is one of the very few materials able to maintain its structure even with exposure to temperatures as high as 5000°F. Furthermore, graphite is less likely to change due to aging as it is a non-fatiguing material. Typically finer grain graphite is used to fabricate graphite rods, however high density and coarse grain stock is available for applications where a smooth surface or finish is not necessarily required. 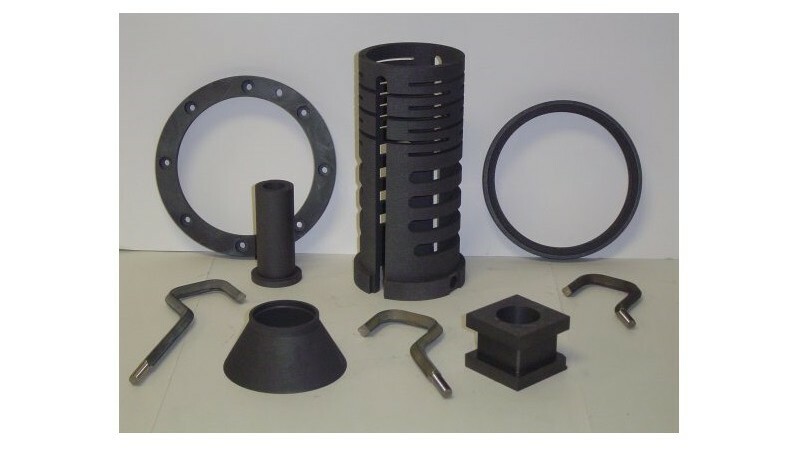 Rod extrusion, compression molding or isostatic pressing are the methods most commonly used in the fabrication of graphite rods, and each is more suitable to specific applications. Graphite is a non-reactive material which makes it ideal for use in industries such as fiber optics and semi conductor applications which tend to be sensitive and precise. Graphite is a structurally sound and reliable fabrication material and is able to maintain its integrity of shape and its electrical conductivity even in environments or applications of extreme temperatures. Unlike most metals, graphite’s structural strength and durability actually increase with temperature rises. As with any fabrication or material choice, there are certain factors to be considered, and graphite rods are no exception. Intended use, length of application to extreme heat, weather elements, stress or tension as well as the specifics of the rod dimensions all need to be carefully considered when determining whether graphite is the best material for the application. Another common use of graphite rods is in fishing, especially for smaller fish as graphite is a light and durable material. Due to the nature of its material construction, it is also sensitive and so is ideal for fishing specific species which may not require as much rod strength because of their smaller size or weight. Graphite Rods Graphite rods are lengths of differing diameter of machined graphite or graphite mixtures that are fabricated into rods and used for a variety of applications, especially in the fiber optics and semi conductor industries.